In the 19th century, the one time British Prime Minister, and renowned novelist, Benjamin Disraeli, wrote a novel called Sybil: The Two Nations; this was one of the first explorations of the polarisation of wealth and power that capitalism breeds, how inside a single country, coexist the fabled halls of plenty and extreme hunger. Today, in India, one does not even need to compare the metropolis and the margin (the “Maoist afflicted territories”) to comprehend the existence of two such nations – it is to be seen in the Capital itself. In the last decade the name of Delhi has become synonymous with “development”; fancy flyovers, expressways, wide roads, metro services, etc. symbolise the form of development that Delhi aspires toward – development that will make Delhi a “world class city” of the new millennium. And all this at the cost of neglecting completely, the fulfillment even of basic necessities of life for many living in and around Delhi. At present, it would seem on glancing at mainstream newspapers, that the development of a city is to be measured in terms of the number of shopping malls it has, or the number of millionaires, or the width of roads and so on – in short, everything which relates to the richer section of society. A supplement of one India’s leading dailies declares Delhi to be the city of the 21st century, moving ahead of other Indian cities like Mumbai and Kolkata. This declaration, ostensibly, is based on the one hand upon Delhi’s new born pride, the Metro, and on the other on the city’s status as the “melting-pot” of all Indian cultures (possibly because the industrial zones rising around Delhi attract workers from all over the country). Not a paragraph to bring out the conditions under which these workers live or labour. With majority of the population, the labouring and languishing poor altogether out of contention, India indeed seems to be shining. Even if the class that actually reaps the benefits of such development comprises 10 per cent of the nation’s population, the number is still in excess of a 100 million. It is easy to stay within this constituency, represent and celebrate its interests, and still call oneself the representative (government, or daily) of a nation. Of course, there are times when even large sections of the richer nation inside India, the so-called middle classes are affected for the worse, by policy or development plans. But such is the inertia of their past comforts, and such is the influence of the state, that they are able to while away times of duress dreaming of riches to come. All their responses are programmed by the state, in forms the state can control, and in the final instance they are comfortable even in this relative discomfort, and they do not feel pressed to speak up. Coming to the immediate, we find that all of Delhi’s resources are being invested to prepare for the staging of the Commonwealth Games; all of the city’s development plans are spread around this event. 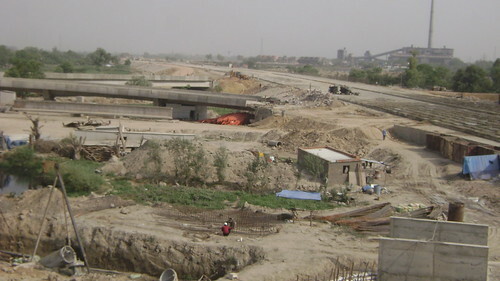 Several new roads are being built, new stadiums are coming up, a concrete “village” big enough to house the people of many slums has been constructed for the athletes. A city facing one of the biggest water shortages in all its history is going to fill up massive swimming pools. For three years in a row college grounds have been made unavailable to students, putting an end to a lot of sports activity (evidently this is how the CWG is going to encourage sports). Thousands of students, who can barely afford the subsidised hostel rates, have been thrown out of their hostels, forced to find accommodation in expensive areas around the university. The Chief Minister has come out in the media declaring that the people of Delhi will have to pay for these Games in the form of increased taxes, rise in the prices of public transport, and so on (supposedly, all people in Delhi are rich enough to pay this tiny price for the sake of the nation’s and the city’s glory). However the main thrust of the current piece is to spare a glance at that side of Delhi which is altogether ignored by all, including the media. 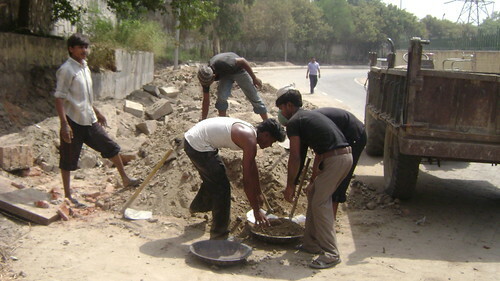 Large numbers of migrant labourers have shifted base to Delhi because of the work become available due to the large scale infrastructural development leading up to the Games. This huge influx of migrant labourers , in addition to the ones already living in slums and worker localities around the city, has led to greater competition amongst them, on which private contractors hired by the government are thriving. These private contractors are able to control wages and working conditions, obviously to the disadvantage of workers. Workers at CWG sites earn anything from Rs.200 to Rs.700 for eight hours of work in a day depending upon level of skill, much more, it can be argued than the minimum wage fixed by the government. Using this data the mainstream media is often found trying to prove that the government is generating employment for these workers as well as helping them earn a livelihood. Often, it is added, that the workers are also being provided with a place to live, in temporary settlements near construction sites. But, as is always true in such cases, a different order of truth altogether ignored by the media exists behind this façade. These workers have no job security, hired on a day, fired on the other. In fact, most of them are hired on a daily or weekly basis. If hired for longer durations they face irregularities of payment. They do not have the freedom, as a result to work elsewhere during this period, or to leave this work, for the fear of having to forfeit wages earned. 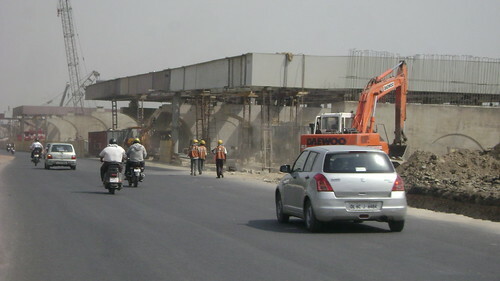 Sometimes workers are paid not according to the duration of work, but quantity of it – this much pay for this much work (for instance, this is usually the case for road construction workers). In this case the work day extends upto ten hours or more; this, one can understand, is the cost of the alacrity needed to finish the project in time for the Games. 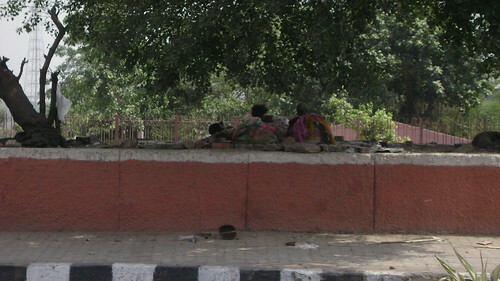 Owing to irregularities of the kind mentioned above, workers are forced to shift their families close to the work-site where their wives too enter the labour market, hoping to find greater financial security for the family. Female workers get paid amounts much lower than what men earn for the same work. 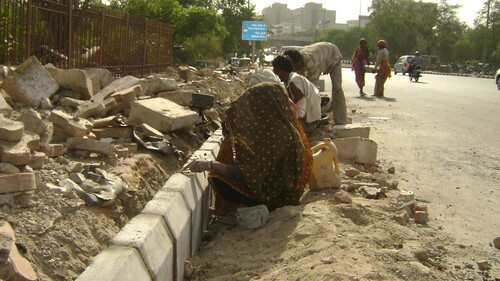 Where the fixed minimum wage is Rs.203, female workers are usually paid as little as Rs.130 for eight hours of work. When the supply of workers increases this drops down to Rs100 or less. Furthermore, mothers have no choice but to keep their children close by while they work; a more hazardous environment to bring up a child is hard to imagine, because immediate danger of hurt is compounded with assured health trouble in later life. Children already nearing adolescence actually work alongside their mothers; a little more in the family’s pocket. Why should all the members of a family work when one member is already earning more than the fixed minimum wages? Clearly, the life that a single man’s wage affords is not quite so good. The minimum wage allows a worker to reproduce his labour power and is by no means suitable remuneration for the work he does; to be able to do even a little more than merely exist (even if that something is as seemingly inconsequential as owning a transistor) more than a single person’s wage is needed. So the whole family sets to work, at jobs that hardly pay anything even as they break their backs. Whether they work or not is not a choice, is clear enough to see, but even choosing the work they do is not an option – do what you get. With increased migration and the fall in wages caused by the resultant increase in competition living condition of workers have also suffered. 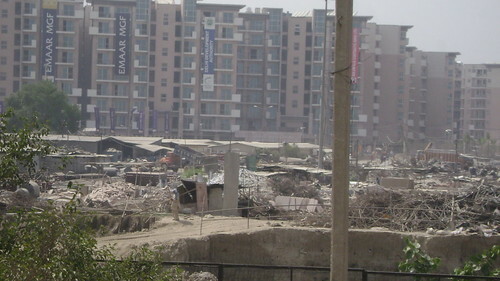 As the wages fall well below the minimum required for their subsistence the workers are forced to live in temporary settlements near work sites, settlements hardly suited to be inhabited by human beings. 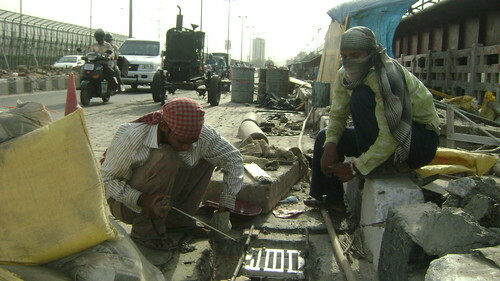 The differentiation between skilled and un-skilled labourers seems to continue in these settlements, where un-skilled workers are made to stay pretty much anywhere (tents beneath flyovers, or on the roadside, or next to metro-pillars and so on). 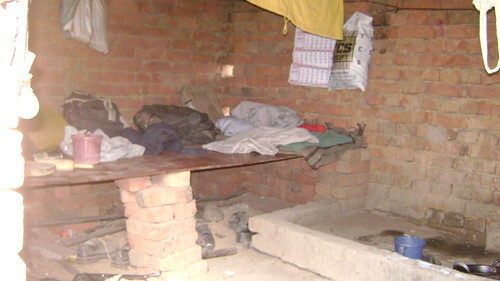 Skilled workers are at least able to afford a place in some sort of slums or worker localities, or are provided with tin shelters near construction sites. Of course this relative privilege hardly amounts to anything; 4 to 5 skilled workers stay in tin rooms hardly 6 feet across. Often these temporary tents or rooms serve as living quarters for the entire family; proximity to the worksite definitely adds to health problems that workers and their families face. There is no direct supply of water to these localities, forcing the workers to use water stored in unclean cans which used for construction purposes; the problem is even greater for the quarters which are not that close to any big site, as they are forced to buy water form tankers. 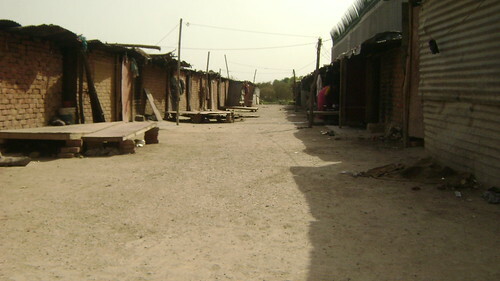 Furthermore, these settlements are not legal and once the work is complete the workers are forced to evacuate. 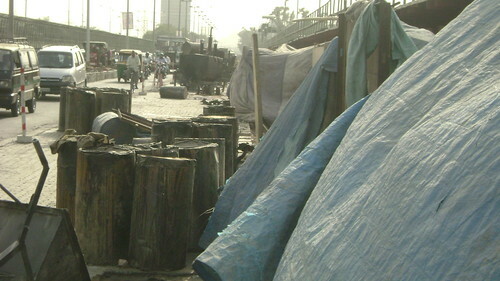 Workers cannot afford to waste any part of their wages on daily commuting; another reason that forces them to leave close to worksites is their shift timings (for instance the workers constructing roads stay in tents near the site because they are required to work all through the night stopping in the early hours of the morning). These conditions negate the possibility of any “family life,” a middle-class term altogether alien to the lives of these workers. Even if the family stays together, everybody works: the man, the woman, and the children, giving them no chance to spend any time together, let alone “quality time.” A set of people involved in the construction of the structures that will allow India to “proclaim itself on the world-stage” as a rising “super-power” and a “quasi-developed-country” are reduced to a status little higher than the tools they use.